Karnataka Bank is leading Private sector bank of India.It has pan India presence.It has a network of 824 branches spread across 22 states and 2 Union Territories. It is based on Mangaluru in Karnataka. The tagline of the bank is “Your Family Bank Across India.The bank has the Best Bank Award for “Managing IT Risk” under small bank category for the year 2010-11, instituted by Institute for Development and Research in Banking Technology (IDRBT). 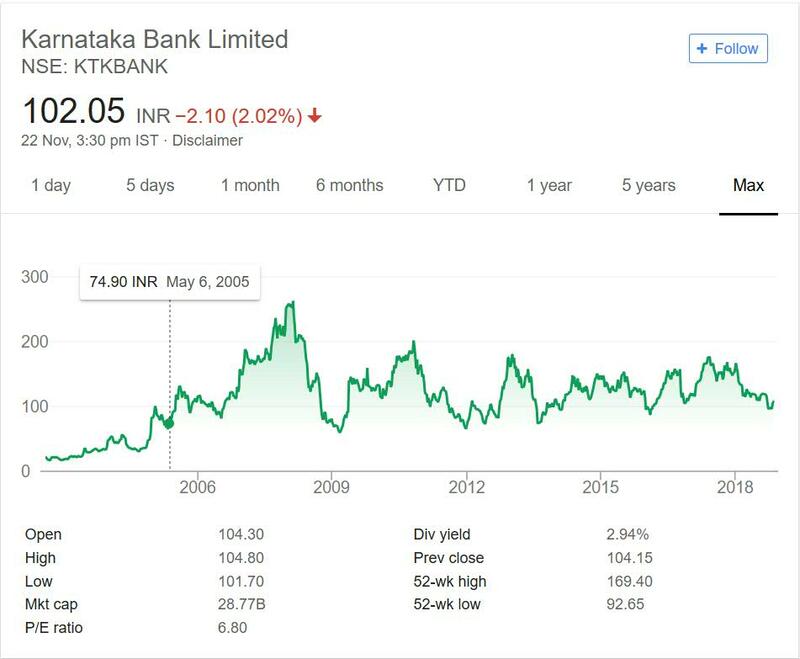 Over the years we have seen that public sector banks have not performed on the exchanges but private sector banks have made money for investors.It will be interesting to see how well Karnataka bank has performed for investors compared to other banks. Note I will not perform comparison in this post but I have separate post which deals with performance of other banks. So you can compare it with them and decide. Lets see how well the company has performed for investors. Below is the price performance of the bank for past 16 years or so. The bank was trading at 22 mark in year 2002.In next 6 years it increased more than 10 times. It created great wealth for investors during this time frame. Like all companies it suffered due to 2008 Global crisis. The stock prices landed below 100 mark during this time. Since then it never really recovered and went past the all time high it made in year 2008. It has touched 200 mark once in year 2011. But since then it has not touched that mark as well. So the upside is limited and stock always traded below 200 mark. With time the bottom is shifting up with time. It has now made a bottom near 100 mark. In other terms you can say that stock went into consolidation mode after year 2009 crash. The dividend yield of company is excellent. At current market price it is giving dividend close to 3% to the investors. If you have invested at 2002 levels or after 2009 crash then you have made money in the counter. Recent investors did not made much due to range bound movement. Karnataka Bank is in portfolio of Vijay Kedia. He is one of the top investors in India. There are not too many investors who have private sector banks in their portfolio. So Vijay Kedia is one exception in this regard. As I mentioned before you should compare performance of it with top performing private sector bank (HDFC Bank) and see how it compares in comparison to HDFC bank. Private banking space will continue to grow at cost of public sector banks. This has been trend in past and it will continue in future as well. After merger of public sector banks there will be few large players from that space. It may be tough to compete with them but private players will have advantage. The competition will be there and big private players will have advantage. So instead of investing in smaller players like Karnataka bank I would rather invest in bigger players. There are many private sector banks which have performed better than Karnataka bank. You can add these banks to your stock watch list and compare before making a decision. Note many top investors do not have any private sector banks in their portfolio. So you can also create portfolio without investing in this space.